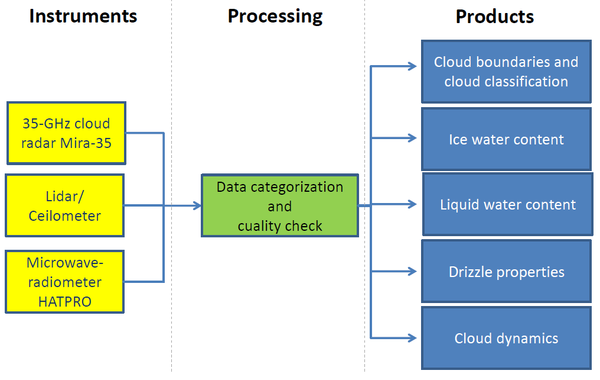 Cloudnet provides a number of algorithms for the continuous analysis of cloud properties which were observed by means of remote-sensing. Cloudnet was founded as a research project supported by the European Commission under the Fifth Framework Programme, contributing to the implementation of the Key Action "Global change, climate and biodiversity" within the Energy, Environment and Sustainable Development. Currently, it is supported by the seventh framework program of the European Commission as part of ACTRIS that also incorporates Earlinet. To optimise the use of existing data sets to develop and validate new cloud remote sensing synergy algorithms. To continuously evaluate the representation of clouds in climate and weather forecast models. To demonstrate the potential of an operational network to improve the representation of clouds in models. Since August 2011 the vertical structure of clouds and aerosol layers is continuously recorded above TROPOS. This is achieved by means of permanently running measurements of the remote-sensing instruments of the LACROS instrument suite. To obtain an overview of the collected data sets, techniques are required which allow for a robust quality-assured data analysis. For this purpose, TROPOS became member of Cloudnet in December 2011. The structure of Cloudnet is described in Figure 1. On that page you can find quicklooks of a selection of cloudnet-derived parameters obtained from the measurements perfomed of LACROS. Fig. 1: Structure of Cloudnet. Within ACTRIS it is planned to combine the techniqes applied in Earlinet and Cloudnet. The goal is to add improved capabilities for the characterization of aerosols into the operiational data analysis scheme of Cloudnet. At TROPOS currently a technique is developed in the framework of HD(CP)² to add an aerosol-type categorization into Cloudnet that is based on measurements of multiwavelength-polarization lidar.